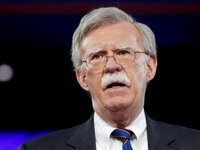 There are both economic and strategic components in the issue of concern for the Nord Stream 2 project, while Ukraine needs to seek alternative natural gas resources, Assistant to the U.S. President for National Security Affairs John Bolton has stated. We with the prime minister of Ukraine held a very interesting discussion on energy resources and the role Ukraine plays, what we can do in future, Bolton said at a press conference in Kyiv. According to him, U.S. President Donald Trump, expressing concern about Nord Stream 2, stresses "not only the economic importance of this issue in Europe ... but also strategic." Undoubtedly, this is what is connected with the monopoly of a supplier of critical energy resources ... Why do you, Europe, voluntarily bind yourself even more to Russian energy suppliers? An alternative option for Ukraine and other countries is to find other natural gas sources and resources, he added. He stressed this is the matter of policy, the government of Ukraine to look for alternative energy resources so that there is no dependence on Russia. Bolton noted that if Nord Stream 2 is built, then Ukraine will remain in a situation of risk that Russia, even if it undertakes, will not supply sufficient volumes of gas.